August 1988 was the last month I spent at home before moving to college where my life changed forever. I still spent my time working at a Caldor store in Warminster, PA and nervously throwing up whenever I dwelled too much on the thought of moving away for the first time. Music wise I continued my lessons with Jim McCarthy, was still listening to a mix of jazz and rock on Philadelphia radio, and practicing with my Epiphone Sheraton. By then I also had an acoustic Fender Avalon (a parlor sized, cherry red guitar with a Strat style headstock) along with my Peavey T-15. That’s right: even at this stage of my life I had too many guitars for someone with too little talent to justify! 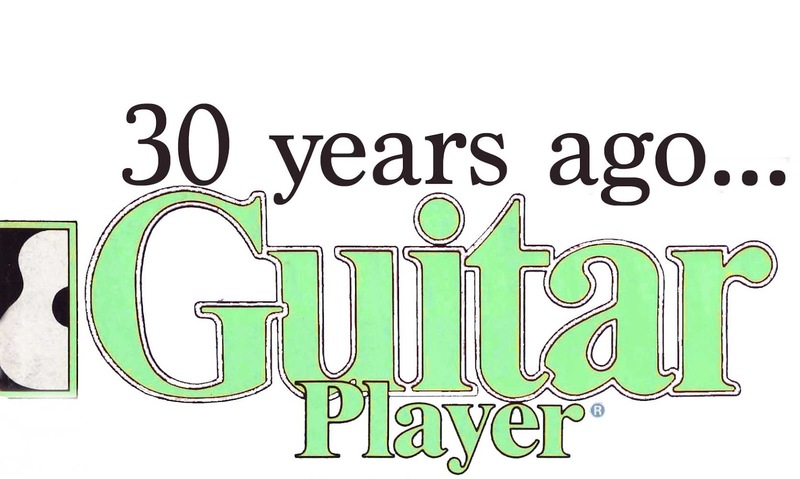 The August, 1988 issue of Guitar Player is a typical for the time diverse mix, which I’m sure I devoured the first time, but re-reading it now I found much of it boring. 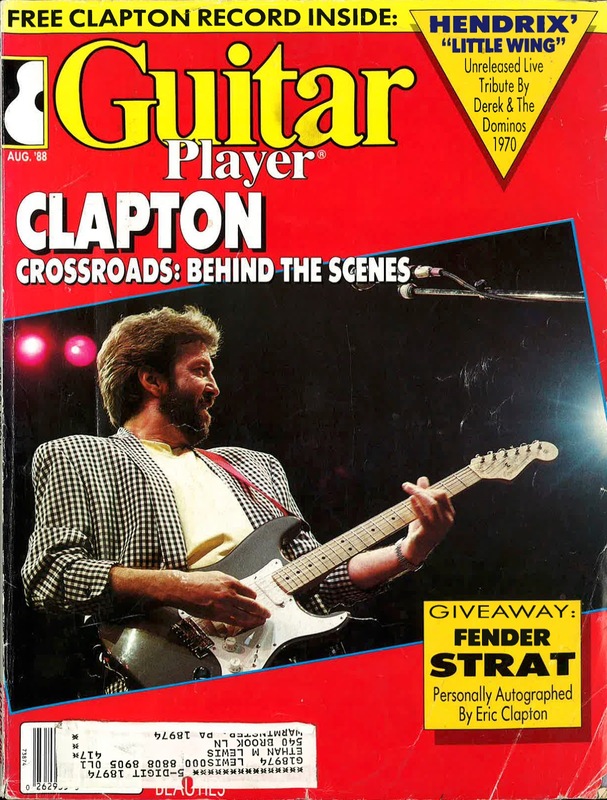 The articles in this issue touch on Eric Clapton, the process involved in making the 6-LP Crossroads set, a photo-essay of rare classical guitars, an article about Norteno guitarist Lydia Mendoza and features on bassist Stu Hamm, Nashville guitar stalwart Fred Newell, more complex details about chord progressions and a primer on “copyright for guitarists”. There was also a very interesting article about the Fender “Nocaster” that is very complete. The July issue marked the first of two straight months of heavy Eric Clapton coverage and this month’s cover story was actually two articles about Slowhand (and they gave away a signed Clapton signature Strat to boot). As I noted last month, I found a Spotify playlist that includes almost all of the content of the box set if you want to check it out. As I wrote last month “In 1988, Eric Clapton was 43 (five years younger than I am now). 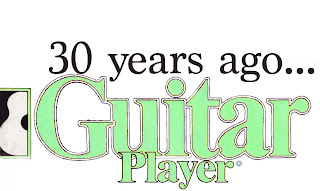 To teenage me, he was a contemporary musician with lots of great stuff in his back catalog, but it’s interesting to see how the writers at Guitar Player (in this, and other articles) treat him as an old man. Think of all that he had yet to accomplish/experience: sobriety, the death of his young son, huge pop stardom with his Unplugged record, 10 more studio albums including multiple excellent “all blues” albums, three “Crossroads Guitar Festivals”, happy marriage and the birth of three daughters and the sale of hundreds of instruments and memorabilia to fund his Crossroads 12 Step Treatment center in Antigua.” This month’s issue continues to treat Clapton as an elder statesman, but does do him the credit of asking about future plans. The “Clapton At The Crossroads” interview with Dan Forte (who had been rather negative about the box set in the previous month’s issue) was mostly focused on the box set and the August issue’s special flexidisc “soundpage”, a live version of Derek and the Dominoes doing Hendrix’ “Little Wing” shortly after Jimi’s death. You can hear this version on the soundtrack to the Clapton documentary “Life In 12 Bars” and is in this month’s playlist below. With [Crossroads] doing so well on the charts and there being so much interest in it, does it create a situation where you’re in essence competing with your past? Of all Hendrix’ songs, why did you choose to cover “Little Wing”? It just had such a powerful atmosphere. There was something very magical for me on his albums. I always went for the more dreamy things–as opposed to the more bluesy or heavy R&B or rock things. I found that his lyricism when he was writing ballads, like “Wind Cries Mary” or “Little Wing” was so different, in a way, that it was powerfully attractive to me. And I realized that those songs could be done by other people too; you didn’t need to be the wizard that he was in order to play the song itself. Those songs in fact were much more structured than some of his other things, and more melodic too. As you know, Sting did “Little Wing” as well. The song itself, because of the way it was written, stands up so well–so anyone could do it. In a way, the song was more important to me than who did it, actually. I think that was what it was. After Hendrix died, was it different performing that song live? It’s pretty hard for me to remember how I was feeling, but knowing the way my attitude was, I mean, I shut off my emotions towards Jimi, in a way, because it was such a devastation for me after he died. If I was doing the song now, I imagine I would try to detach from the memory of it, because it would simply be too over-emotional to perform with Jimi’s image in my head at the time. There’s times when that can just distract you beyond belief. So I was probably doing it in as objective a way as I could. But that’s not to say that it wasn’t an emotional experience. On [your last] tour you went back to being the only guitarist in the group. What prompted the return to solitary guitarist? Well, I find that sometimes I get very uptight around other guitar players. If they’re younger than me, they’re either in awe, or they have an attitude before they start, you know, which I have to kind of try to break down. Sometimes it means that they’re going to be flying all my old licks at me, or kind of making me too aware of my past, and we get stuck with that. The only time this hasn’t happened has been when I’ve worked with Mark Knopfler. Although he’s very appreciative of what I’ve done, he’s kind of a forward-looking guy and we’re about the same age, so there’s no competitiveness or anything like that. So we work very well together, and I think he’ll probably be very much involved with what I’m doing from here on in–up to a point, anyway. Did you decide to retire your old Stratocaster, Blackie? 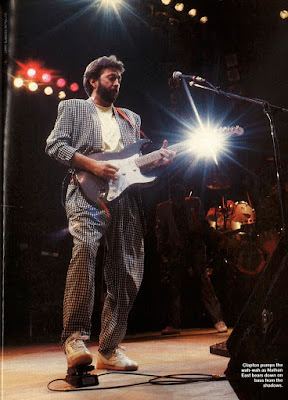 Was that the reason for the switch to the Eric Clapton Signature Model Strat? Yes. I was worried that if something happened to Blackie, I’d be out on a limb, you know. I mean, it’s still playable, although not comfortably so. It’s got a great character–the guitar itself is really a character–and it worried me, taking it around on the road. It just seemed to be unfair; it’s like taking a very old man and expecting him to do the impossible every night [laughs]. So it was Fender’s Dan Smith’s idea to copy Blackie as closely as we could and update it with a little bit of electronic work, to give it a fatter sound, if I wanted it. Which is what one of the knobs does: it gives you a kind of graduation in compression. They duplicated the way Blackie felt, so I would have two or three Blackies, in effect. The guitar that came to be called Blackie was pieced together from various Strats, right? Yeah, a very kind of mongrel thing. I bought about five Strats in Nashville, in about 1969 or 1970, and built Blackie out of all of the best components of each guitar. So Blackie in itself was a hybrid, and now these new ones are copies of that hybrid. Do you still feel like you’re at a crossroads? Well, it’s definitely not behind me. It’s something I can see on the horizon all the time. There’s always an option for me that’s very tempting to take, whether it be shall I go on touring or shall I go into films, or shall I stay married or shall I run around. There’s always kind of different avenues that are very tempting to me, and I don’t think I’ll ever get across the crossroads; it’s always standing right there in front of me, you know. Back in the 80’s cable tv’s The Nashville Network (TNN) had lots of live music, including a daily talk show which featured live performances, called Nashville Now. I watched the show every night just to get exposed to country music (which wasn’t easily available in Philadelphia) and I couldn’t miss the house band’s guitarist, Fred Newell. As was often the case with Guitar Player’s interviews with top session men, Newell’s interview shows how important professional networking and hard work were (and still are), especially in a time before any hot player could become a YouTube celebrity. Newell worked for Waylon Jennings playing steel licks on his Tele, which led to lengthy sideman gigs with Tompall Glaser, Lynn Anderson and Jerry Reed. 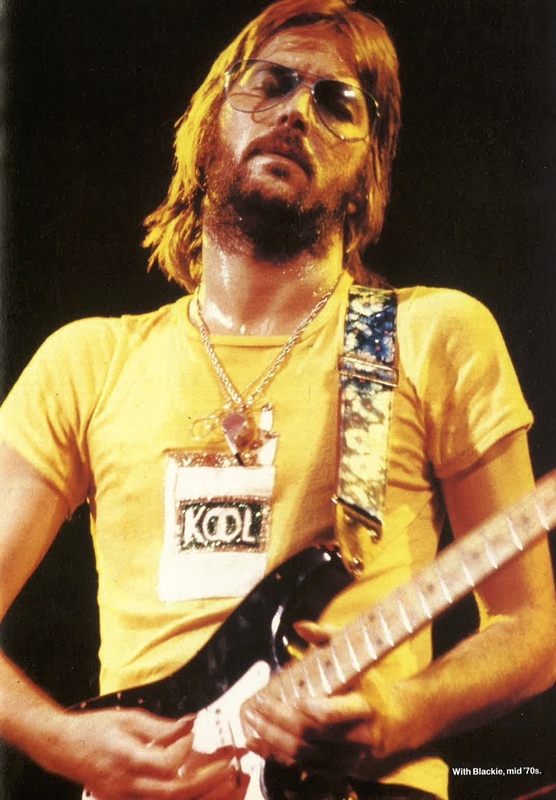 Newell describes getting a big break as a studio musician with the “simple but ballsy” intro to “Heaven Is Just A Sin Away“, by the Kendalls in 1977. Fred’s official role is electric lead guitarist, doubling on harmonica when needed. The band also includes three other guitarists, John Clausi, who doubles on acoustic guitar and banjo, Larry “Wimpy” Sasser, who doubles on steel and dobro, and Hubert “Hoot” Hester, who plays acoustic rhythm guitar, mandolin and fiddle. Each member of the 13 piece band, which includes four backup singers was hired for versatility and steely nerves. “I don’t think you can ever totally relax in this business. I practice every day….A lot of times I pick the guitar up at 6:30 in the morning and just start exploring. You have to be creative and figure out new things to do. I’m really open to experimenting with new techniques, and I’ve been trying to make it a point to learn a new song about every other day. Some days I just work on technique, like working with a thumbpick for an hour or two, just to get back to using it again. Telecaster lovers like to say that “Leo got it right the first time”, but this issue’s “Rare Bird” article by guitar historian Richard Smith discussed the 1951 Telecaster, and how it evolved through stages from the Broadcaster to the “Nocaster”. Many guitar aficionados know that Fender’s first solidbody electric was called the “Broadcaster”, but that the Gretsch company forced them to change the name because Gretsch had a line of drums called “BroadKaster” and didn’t want the market to be confused. Of course, it’s poetic justice that Fender now owns Gretsch! 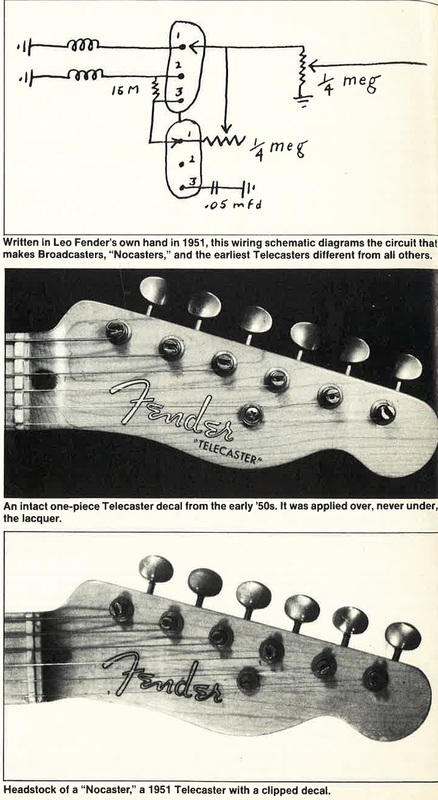 Anyway, for a few months “while the attorney for Fender’s distributor conducted a trademark search for the Telecaster name”, the guitars were sold with the model name clipped off of the headstock decal, as pictured below left. Eventually the guitars became Telecasters, as we know and love them today. That’s all for this month. I hope you enjoyed it, and that you’ll come back for next month’s jam packed issue featuring a cover story about Robben Ford. Until then, keep on picking!